Losing iPhone data is a very common phenomenon in our daily life. Many behaviors may cause data loss such as one wrong tap, system crash, device stuck on Apple logo, virus attack, or system upgrade failure as Wallace encountered, etc. The worse thing is that you even haven't backed up your data. 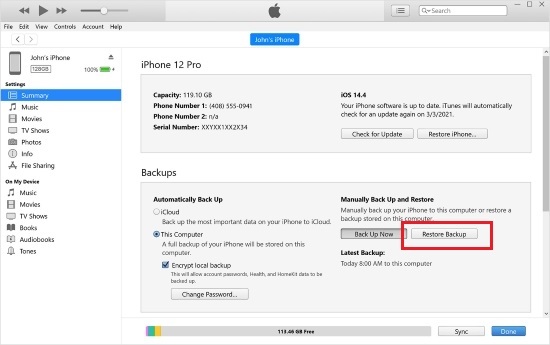 For keeping your important iPhone data, I suggest you to back up your iPhone regularly, so you will get more chances to restore it when it's accidentally missing. If not, you're no worried, either. In this article, we'll show you how to recover iPhone data without iCloud backup efficiently. Step 3: Next choose the most relevant iTunes backup file and then click the "Restore" button to start restoring lost data from iTunes backup. When the progress bar comes to the end, you'll find the lost data come back to your iPhone again. If not, you can restore another iTunes backup that may possess the missing data with the same steps above. As you can see, the first method may help your restore your lost data, but it is not 100% working. You need to take several attempts and it may take you a lot of time. What if you can preview before recovery and select what files you want to restore? That's a good idea. Joyoshare iPhone Data Recovery can help you realize that purpose easily. 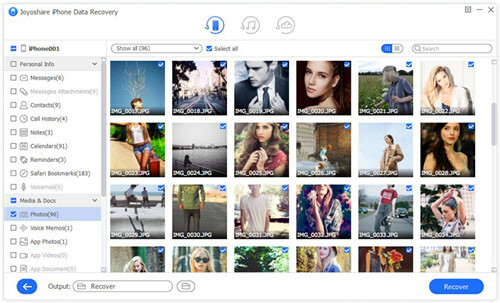 With the support of real-time preview function, Joyoshare iPhone Data Recovery can enable users to find the lost files in a few clicks only. After that, you can simply choose the files you want and then restore them to your computer with a very high successful recovery rate. 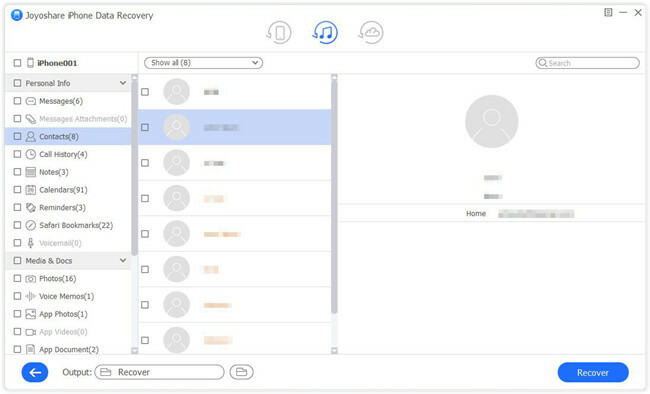 Besides, this powerful iOS recovery utility can restore lost iPhone contacts, call history, photos, videos, text messages, Kik messages, WhatsApp, Viber data, and many other missing files. However you lost them, Joyoshare can salvage them with 3 smart recovery modes. 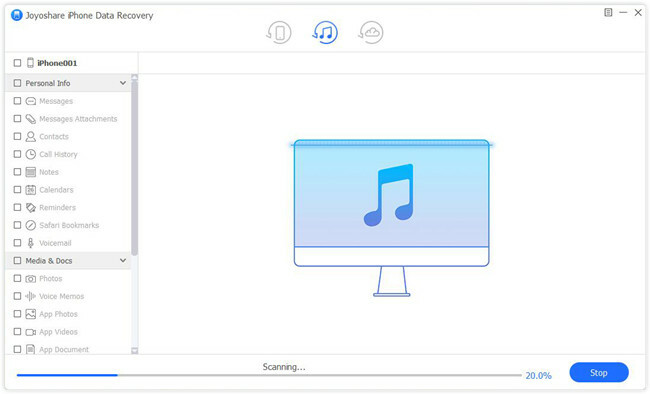 Simply launch Joyoshare iPhone Data Recovery on your program and then choose the recovery module of "Recover from iTunes" from the top menu bar. Now you'll see all your iTunes backup files in a list, with the device model, backup date, size and other information displayed. You can pick the one that may contain the lost data, and then click the Gear icon next to it and select the file types you want to recover. Next just click the "Scan" button and Joyoshare will start to scan and analyze the lost data from your backup. Wait a while until the scanning process is completed. Now all the recoverable files have been classified in categories. Choose the ones from the sidebar and start previewing them. To save your time, you can also filter out the "Only show the deleted" option or enter the keywords to search. Next you can hit the "Recover" button and a few minutes later your lost file will be exported and saved on the local folder of your computer. Another situation is that you lost your iPhone data and even have no iCloud and iTunes backup. What should you do? Well, Joyoshare iPhone Data Recovery is still the way to go. This intelligent program can help users recover lost or deleted iPhone data without backup and won't erase the current data either. 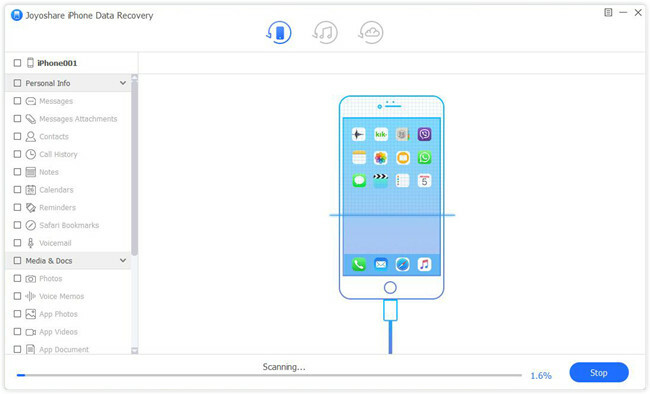 Just follow the step-by-step instruction below to learn how to use Joyoshare iPhone Data Recovery to recover data from iPhone directly. 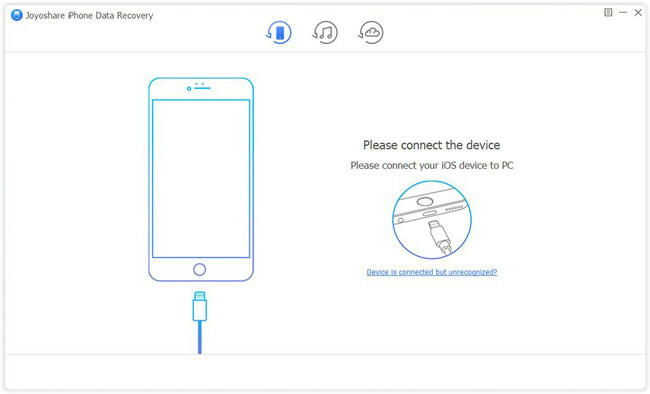 Under such Circumstance, you need to use an original USB cable to connect your iPhone to the computer first. Then launch Joyoshare on the desktop and it will detect your device automatically. 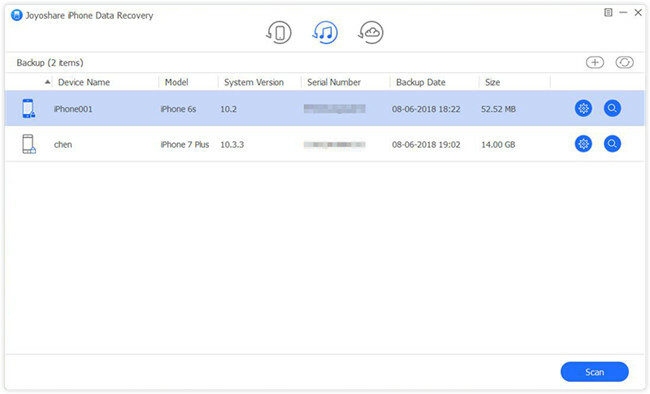 After Joyoshare recognized your iPhone successfully, it will enter the "Recover from iDevice" mode by default, where you can see the basic info of your device as well as the deleted/existing data on the device. Next tick the data types you'd like to recover or just keep it all ticked as default. Continue to click the "Scan" button to scan the lost files from iPhone. Once the scanning process is finished, you're now allowed to preview and select the lost files you want. Afterwards, press on the "Recover" button to export all selected ones to your computer.